As promised, a tutorial for some holiday embroidered napkin rings. These are pretty quick and easy to whip up so it's not too late to put together a set for your Christmas dinner or a gift for your stitching pals. Notice there are buttons in the photo. I thought about putting them on but decided I didn't like it. I left them in the photo because you might decide you like the look. 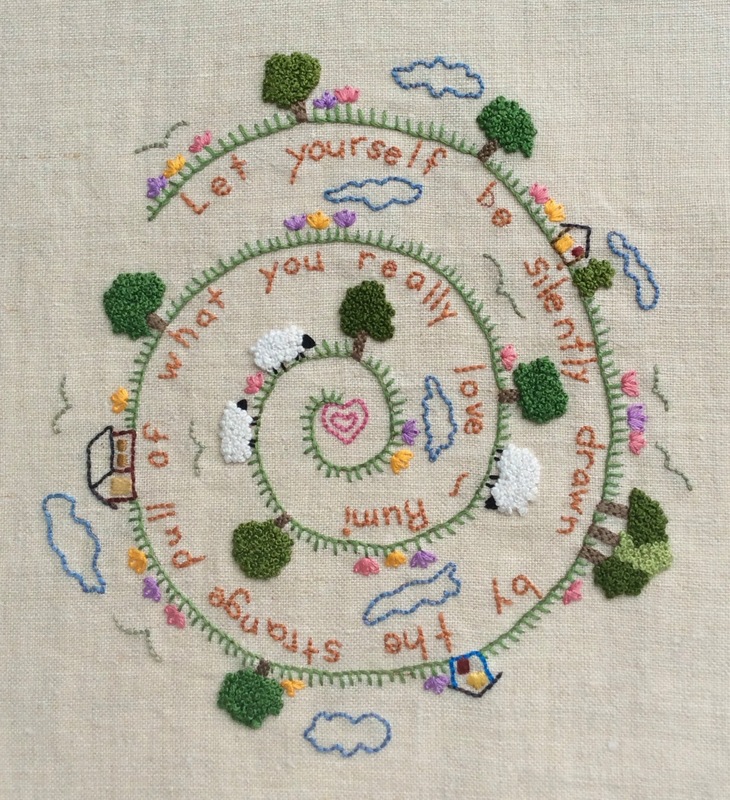 Also, both embroidery stitches used are linked to a video tutorial on Mary Corbet's site. To begin the embroidery, using three strands of #840 stitch a line using a backstitch down the center of the white felt. I didn't draw a line, just eyeballed it. If you want you can measure and make small dots with a fine marker as a guide. I left about 1/8" at each end. Notice my line is not perfect! I don't worry about things like that. Branches aren't perfectly straight either!!!! Now time to add the pine needles. I decided to stitch these with two different greens in the needle at the same time. This creates a bit of a shadow effect. Measure out two strands of #367 and one strand of #890. Make sure they are the same length. Put all three strands in your needle together. Starting down about three back stitches make little pine needles in sets of two and three where each back stitch joins. Alternate the stitches on either side of the center line. Work your way all the way down the center line stopping one or two back stitches from the end. Using two strands of #304 make french knots along the center line, alternating sides about 3/4" apart. I wanted to make the french knots fairly delicate so only wrapped the needle two times. You can try three strands and more wraps. Experiment and see what you prefer. Next form the red felt into a circle, overlapping the ends about 1/4". Stitch with small running stitches in matching thread. Center the white embroidered band onto the red felt. Be sure to put the seams for both pieces on top of each other. Pin in place and stitch down with white thread using a running stitch. Add to your favorite Christmas table and ENJOY!!!! I was recently asked where to find embroidery patterns - my etsy shop has a nice one - but there are all sorts of resources online. Pinterest is one of my go to places for most everything and of course, there were some great patterns. Here are a few of my favorite links for free holiday patterns. There is still plenty of time to get some gifts made. Mary Corbett has a lovely Holly and Joy monogram pattern. On this page are directions for creating monograms but if you scroll to the bottom you will find the pdf download links. Cheryl Fall, about.com's stitching expert, designed some easy and quick tags which could go on gifts or the tree. 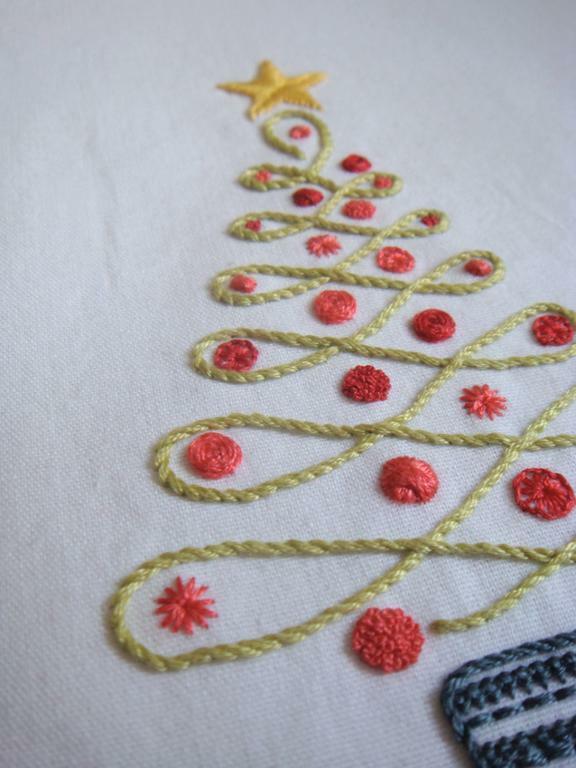 Another design by Cheryl Fall is a Christmas tree using detached chain stitch, eyelet stitch and satin stitch. Very easy and would whip up quickly. I can imagine this on small hand towels or ornaments. This pattern is pictured above and is by Kelly Fletcher on Craftsy. One of my favorites! Regina Lord is the designer and her blog is creative kismet. At the top of the page is an adorable bird design and just below is the tree. She suggests using the design for a tote bag, wall hanging or pillow. My next post will be a simple napkin ring to embroider. It will be a speedy project which will make your table festive!! !